Kuala Lumpur, 12 April 2019 --( ASIA TODAY )--　Kuala Lumpur is set to host global industry leaders as they converge at the Kuala Lumpur Convention Centre on 23–25 June 2019, for the 20th Asia Oil & Gas Conference (AOGC). Muscat, Oman, 8 April 2019—The third edition of Oman Downstream Exhibition & Conference (ODEC), organized by Omanexpo and World Refining Association (WRA), is set from April 15 to 17 at the Oman Convention & Exhibition Centre. StocExpo Europe’s new divisional director has high ambitions to take it to the next level as the event prepares to celebrate its 15th anniversary serving the bulk liquid storage sector. Thailand plans to build the world’s largest floating solar farms to boost the country’s share of clean energy, Bloomberg News cited Thepparat Theppitak, a deputy governor of state-run Electricity Generating Authority of Thailand (EGAT). GUANGZHOU, China, Feb. 21, 2019 /PRNewswire/ -- Ledman, China's leading LED manufacturer, is bringing its latest LED display products to the 2019 International Signs and LED Exhibition (ISLE 2019), which is set to take place from March 3 to 6 in Canton Fair Complex in Guangzhou, China. 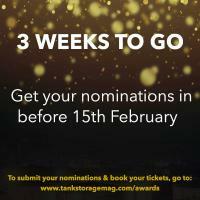 The deadline for the Global Tank Storage Awards is just under three weeks away, with entries closing on 15th February 2019.